Our standard wall mounted pull up brackets are 28 inches extending from the wall and extremely strong. The bar that is provided with them is 1 inch in diameter and 48 inches long. 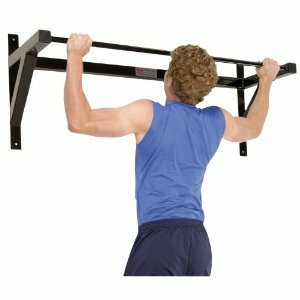 The Standard Wall mounted pull up bar comes with one bar and two brackets. These brackets are very popular and easy to install. If you want a longer area to do pull ups then please contact us and we will arrange how many brackets you need to support the bar. Powder coated finish. Black frame with red bar.